There was sunshine, palm trees and the endless expanse of ocean. There was golf with Jack Nicklaus, the most successful player of all time. There was a dinner that included stone crab, oysters, jumbo shrimp and clams; turkey, beef tenderloin, lamb and salmon; Chilean Sea bass, red snapper and braised short ribs. 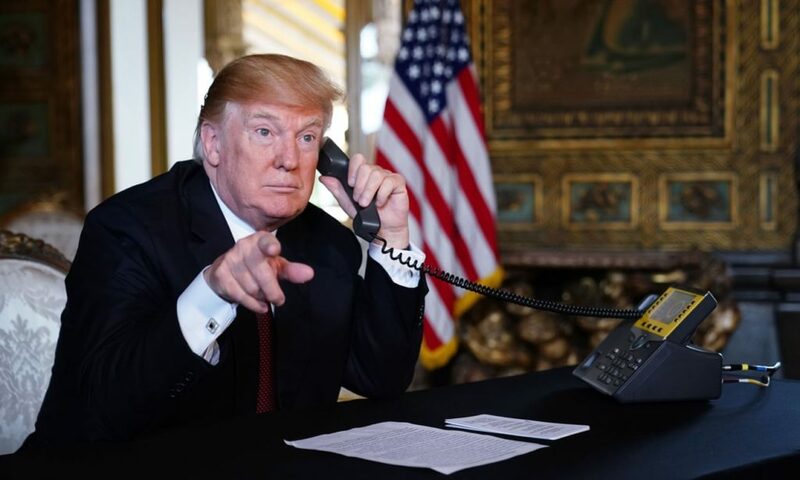 But as Donald Trump spent Thanksgiving at his opulent Mar-a-Lago estate – or “the southern White House”, as he called it in a teleconference with the military – there was something else on the menu: self-congratulation, grievance and paranoia. The 72-year-old was being confronted by a glimpse of what life might look if the electorate forces him into early retirement. One long game of golf in the Florida sun. Trump is approaching the midway point in his presidency and, some argue, a point of no return. The recent midterm elections left him wounded, House Democrats are said to be aiming a “subpoena cannon” at every aspect of his life and special counsel Robert Mueller’s Russia investigation appears to be nearing its endgame. But on 6 November, the American people delivered a reality check. Republicans held the Senate but as the final House results trickle in, Democrats lead by more than 8.6m votes: 53.1% to 45.2%. The party has a net gain of nearly 40 seats, its biggest sweep since Watergate. Ominously, they won in rust belt states that were pivotal to Trump’s victory in 2016. Trump fired Jeff Sessions and hired Matthew Whitaker as acting attorney general, in what many see as a threat to the special counsel. He tried to ban a CNN correspondent from the White House but lost in court. He skipped a visit to a military cemetery in France. He criticised the admiral who oversaw the raid that killed Osama bin Laden. He floated bizarre theories for the wildfires in California, twice referred to the destroyed city of Paradise as “Pleasure” and revelled in ignorance of climate change. He referred to the Democrat Adam Schiff as “Adam Schitt”. He issued a bewildering statement (633 words with eight exclamation marks) questioning the CIA’s reported conclusion that Saudi crown prince Mohammed bin Salman was responsible for the death of Washington Post columnist Jamal Khashoggi. His daughter Ivanka was caught using a personal email account for government business. He scolded the ninth circuit court of appeals, earning a rare rebuke from the chief justice of the supreme court. It was reported that he wanted the justice department to prosecute Hillary Clinton and former FBI director James Comey. He authorised troops on the US-Mexico border to use “lethal force”, despite concerns their presence is a political stunt. And another thing: the stock market tanked, raising fears of economic slowdown. Trump’s inability to stay silent suggests he has learned nothing from his election drubbing. Other presidents have suffered similar fates in the midterms, only to bounce back and win re-election. But they have done so by making changes and showing humility; when Trump was asked by Fox News to rank himself in the pantheon of great presidents, he awarded himself an A+; when he was asked by a reporter what he was grateful for on Thanksgiving, he talked about himself. The situation is only likely to darken, Jacobs predicted. “Obviously with the investigations starting soon in the House, Trump and Republicans will be able to tarnish Democrats as obstructionist, but if Democrats manage to reveal corruption, it’s going to damage Trump’s claim to drain to swamp. He’s going to look swampy. Although Trump seems to have conquered the Republican party, Jacobs believes its members will read the runes, especially the Senate majority leader Mitch McConnell, noted for his ruthlessness. Jeff Flake, the retiring senator from Arizona, has called for Trump to face a primary challenge. It has long been speculated that Trump has something to hide: his tax returns, his business dealings, his peculiar devotion to autocrats. Now all are about to be put under the microscope by Schiff and others. There are also signs that Mueller’s investigation could be reaching a critical phase, with Trump having submitted written answers and reports that a fresh set of indictments centered around WikiLeaks and Roger Stone is imminent. Just because Trump is paranoid doesn’t mean that they aren’t out to get him. Rick Tyler, a political analyst and Republican consultant, said: “Donald Trump seems like he’s worried about two things. First, he’s clearly worried about the Mueller report. If it was purely a question of ego and whether Russia helped him get elected, this is an overreaction. There’s something else going on. Perhaps. But Democrats are spoiling for a fight. Kurt Bardella, a political columnist and former congressional spokesperson, said: “We’re going to see for the first time in his presidency some substantive pushback from Congress. Democrats will no longer be passively commentating; they will be able to take tangible steps to find out what’s going on in this administration. “Starting in January, Congress has the tools and mechanisms to push more and do more than be outraged. They can hold hearings, get documents, compel testimony. They can get access to the people around the White House and see what they think is going on: are people raising the alarm?